Regale in the Great Barrier Reef’s most exclusive luxury haven where you’ll revitalize and energize. Cairns, Sydney and the Great Barrier Reef are the spotlights showing you the true Colors of Australia. Feel the aura of Daintree at Silky Oaks Lodge, nestled inside the oldest living rainforest on earth. Jet set to Lizard Island set on the world’s largest reef, a spot renowned for diving and catching a glimpse of the elusive Moray Eel. This private paradise is an exclusive environment perfect for slipping away from the world. Fall in love with Sydney, a cosmopolitan city unlike any other. People watch on trendy Oxford Street or get lost exploring all that this booming metropolis has to offer. Today you will begin your Swain Destinations customized itinerary. On arrival into Sydney, you will need to clear customs and make your way to the domestic terminal for your flight north to Cairns. On arrival, you will be met by your driver and transferred to your accommodation in the Daintree Rainforest. Nestled on the edge of the Mossman Gorge in the Daintree Rainforest, Silky Oaks Lodge is the Daintree’s ultimate resort where this rare wilderness can be enjoyed in elegance and ease. From the moment you arrive at Silky Oaks, you feel the aura of the Daintree. Vast and pristine, it is the oldest living rainforest on Earth. The Lodge itself overlooks the Mossman River so idyllic it has no equal for natural beauty, supreme comfort and ease of access. There’s also the added comfort of knowing you’ve chosen the perfect base to explore the Tropical North Queensland region. Take hike through the nearby rainforest trails, go for a swim in or a canoe ride on the Mossman River, and visit with the tame wallabies that have made the lodge grounds their home. This day is at your leisure. Explore the surrounding area on your own or on one of our additional day excursions. You will be transferred from Silky Oaks Lodge back to Cairns for your private charter flight to Lizard Island. Lizard Island, Australia’s most northern island resort, is renowned for both diving, especially the ‘Cod Hol’’ where you can see huge Moray Eels and the famous Potato Cod, and game fishing for Black Marlin. Located on the Inner Great Barrier Reef (170 miles north of Cairns), Lizard Island offers a private paradise in an exclusive environment. 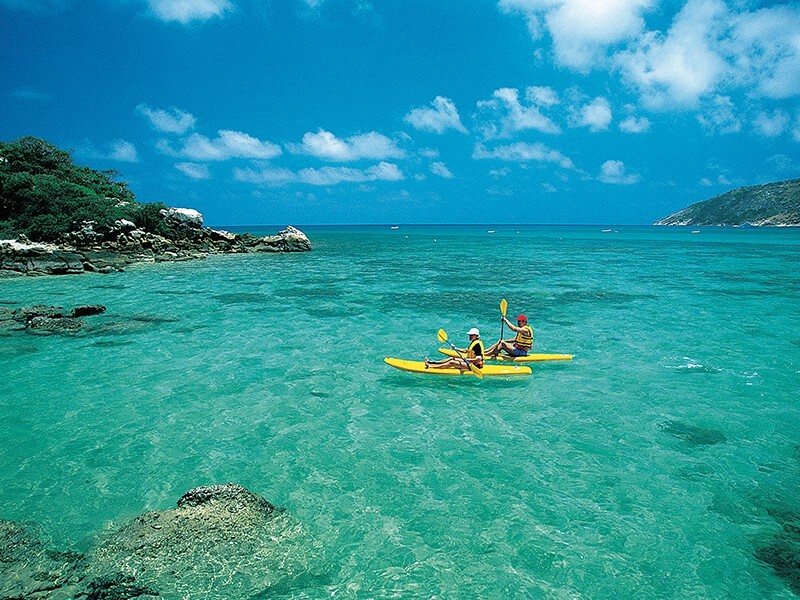 A spectacular setting to explore the magnificent Great Barrier Reef. Snorkel or dive 60 feet from your doorstep on the world famous reef – take a stroll to Cooks Look – visit the Marine Research Laboratory on the island or just relax in a casual atmosphere that is Lizard Island. Today you will fly via private charter flight back to Cairns before connecting to a scheduled service to Sydney. Upon arrival, you will be met at the airport and transferred by private vehicle to your accommodation. Sydney, a dazzling, vibrant city built around one of the world’s most beautiful harbors, with scores of sparkling beaches within easy reach of its cosmopolitan heart – that’s Sydney, capital of New South Wales, Australia’s largest and oldest city, where the first settlers landed in 1788. Situated on Sydney Harbour, adjacent to Circular Quay, The Rocks is the site of Australia’s first European settlement. Colorful streetscapes and elegantly restored buildings house a wide variety of restaurants, entertainment venues and specialty shops. At your leisure to explore the city of Sydney. It’s been said that Sydney never sleeps. In daylight hours the city buzzes with life and remains active long after workers have left their offices. All-night pubs, cutting-edge dance clubs, and gay reviews could keep you out until dawn. Fancy a late-night meal or a final coffee – that’s not a problem. Be seen on trendy Oxford Street from Darlinghurst to Paddington or try the Woolloomooloo Finger Wharf, Surry Hills, the quay or the Rocks. It’s too many choices, not too few, that make the decision hard! During your stay ideally you should take a harbor cruise around one of the most beautiful harbors in the world, maybe take a short trip to one of the wildlife parks to see the unique animals (koalas and kangaroos) Australia has, climb to the top of the Harbour Bridge for some awesome views, and after all that, enjoy the great restaurants that Sydney has to offer. The local chefs take full advantage of the fresh seafood and produce.